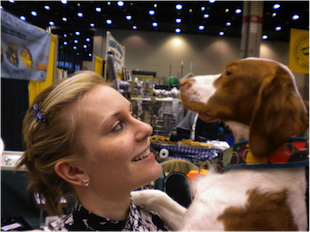 Hali’s interest in dogs began at a very young age when she received her first Brittany, Ginger. She began showing dogs and ever since, her passion for dogs has only grown. After she completed her championship in the show ring with her fourth Brittany, Tootles, Hali decided to try agility and became hooked. Tootles now has received her MACH and is working towards her second PACH. Hali is also running her younger dog, Madison in agility and they are working towards their first MACH. Hali truly loves competing and sharing knowledge. For Hali, watching the bond grow between the individual and their pet is one of the best parts of teaching.